Netflix has a new hidden gem in Ashleigh Murray. Ever wondered how hard it’d be to rob a train? Normally I’d say me neither but Netflix posed this question with a new independent film called Deidra & Laney Rob a Train. Weird title right? Wrong. This movie taught me that robbing a train only look easy. In reality, it takes quite a bit of effort much like life for the Tanner sisters, Deidra (Ashleigh Murray) and Laney (Rachel Crow). Growing up is hard, it’s even harder when you grow up at or below the poverty line. Dreams don’t often come true for these kids. They live in rough neighborhoods. They worry about their next meal. They only think about today, never tomorrow. In both Murray (Riverdale) and Crow’s (Home: Adventures with Tip & Oh) stellar breakout roles, the delivery of real life circumstances paints a true picture of what gets robbed from families like the Tanners. Don’t misunderstand me. It’s a film for the whole family to watch. It’s funny but not forced. Real but not too raw. The stereotypes you see here are not as they seem and it’s refreshingly different. But this is a story of survival. Deidra and Laney are robbed of their childhood innocence and have to survive adult problems long before they ever reach adulthood when their mother, Goldie (Danielle Nicolet, The Flash) is incarcerated. They should be normal high schoolers, obsessing over boys, picking out prom dresses and decorating imaginary dorm rooms. For senior Deidra, this should be her reality but college isn’t always an option for even the smartest kids. It’s a dream. And for Deidra, it’s more than that. It is her way to liberate her family’s cycle of poverty and end their suffering. If only they can make it through one more disaster. Come up with $10,000 to bail their mom out of jail! It’s beautifully written and an unapologetically black female-driven story. Deidra, with her glowing skin and perfectly coiled hair, makes all the decisions instead of her mother. Role reversals like this are often an actuality for firstborns of single parent African Americans. Deidra loses her faith in Goldie, but this Mom preserved her daughter’s dreams of a brighter future the only way she knew how, in secret. Truth is, most moms do this. It’s just that Moms of color do it most often…in secret away from the wide eyes of their precious babies. I’m all grown up now but I recently discovered after all this time that my own mother made the similar sacrifices for me to attend college halfway around the country. I was a kid like Deidra, from a rough neighborhood with a single parent and it looked like college wasn’t going to be in my future. But I credit her as the sole reason I was able to walk across a stage and receive my first degree. If you’ve had an experience like this, watching Murray and Nicolet interact during scenes will absolutely affect your tear ducts. I dare you not to shed a tear or feel a lip tremble. This pair will no doubt give you nostalgia so intense, you’ll make a bee-line for memory lane. 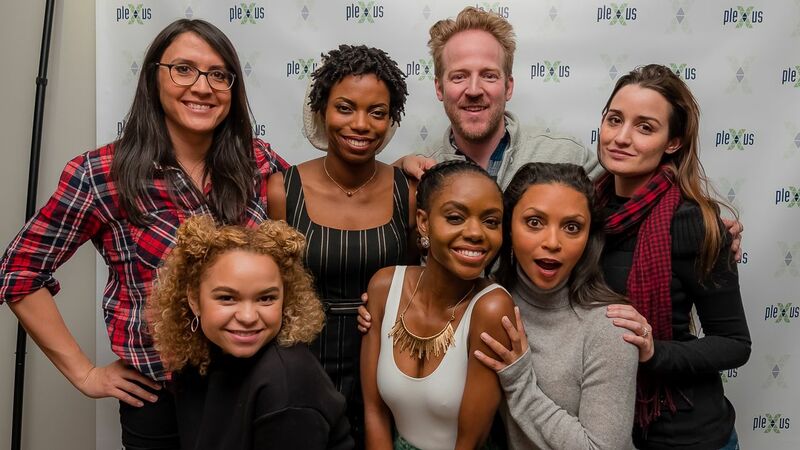 The cast including Sasheer Zamata (Ms. Spencer) with director, Sydney Freeland (Her Story) writer, Shelby Farrell at movie premiere. Among other things, one of the most intriguing aspects of this narrative film is that romantic love isn’t the focus. It actually takes a couple back seats to the familial love that the Tanner family has for each other. Neither Deidra nor Laney can worry about boys when everything else in their lives is taking the front seat. Move over box office hits, Netflix has you beat! Deidra & Laney Rob a Train is one of the most well-rounded love stories I’ve ever seen. You’re gonna want to call your Mom and reach for your dreams harder than ever. Trust me, watch it. Just don’t rob any trains afterward, ok?